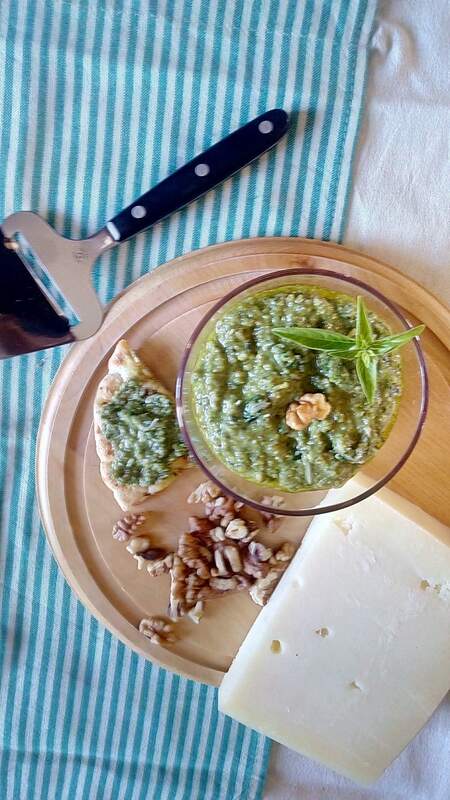 Mint Pesto is a twist to the classic Italian sauce which is made with basil, olive oil, garlic, pine nuts and parmesan. There are many kinds of pestos using different herbs, cheeses and nuts but my favourite is the one I have made with mint and of course almonds and halloumi which are used in Cyprus to suit the tastes and flavours of my country. During Lent or for a vegan pesto, leave out the cheese and you can have the most delicious vegan pasta dishes with combined with other vegetables such as mushrooms, zucchini etc. September is Ovarian Cancer Awareness Month. I have participated at this event last year as well and I shall continue to support it because every woman must be aware of this silent killer. Michelle of Bleeding Espresso and Sara of Ms Adventures in Italy are sponsoring an O Foods Contest. Please see below for the details. Please come and visit here in the next few days, when I shall post some of the recipes I have made featuring my favourite PestO. Mint pesto is my favourite pesto, maybe because we love mint so much in Cyprus and we use it in a lot of our recipes. Whenever I want to make a healthy pasta dish, I add some pesto in it, about 1 tablespoon pesto for each serving. I use it in other recipes as well, so I will be linking back to this post quite often. I have made this pesto over and over again with some other minor changes and I avoid adding the cheese in for many reasons, one being is that when we fast we don’t eat any dairy products. Wash the mint leaves and dry. Put them together with the garlic, salt, pepper, vinegar and pulse, adding the olive oil and nuts gradually until it reaches the consistency of a thick sauce. Note: It can be preserved in the refrigerator for a week. If you deep freeze it, you can have it for a few months. When deep freezing, do not add the cheese and divide it into ½ cup portions. Defrost a couple of hours before using it and mix in the cheese. Put all the pesto ingredients, except the olive oil, in a food processor. Pulse until the ingredients are minced. Start adding the olive oil gradually. Stop to scrape down the sides of the food processor, if necessary. Continue adding olive oil until the mixture reaches the consistency of a thick sauce. Put them together with the, garlic, salt, pepper, vinegar and pulse, adding the olive oil and nuts gradually until it reaches the consistency of a thick sauce. This year my peppermint plant is thriving, so I made the same pesto several times, using fresh peppermint. The picture was taken after I trimmed it to make the pesto. I’ve made the pesto with only pepperment but also combined it with mint and basil leaves. Any combination is just amazing! This time, instead of almonds, I used walnuts and instead of halloumi I used graviera. However, you can add any nuts or cheese you like. The recipe for Mint Pesto is included in my cookbook Mint, Cinnamon & Blossom Water, Flavours of Cyprus, Kopiaste! That is one fabulous pesto! Flavorful! Ivy I see you have used mint in this pesto. I do like the “Greek touches” you have made by including the almonds and the graviera. Brilliant! Can’t wait for more of the recipes! A little while ago I made pesto with oregano after reading a post where you described it. Now you tempt me with a mint version: will do. Thanks for letting us know about the event. Oh, Ivy, what a WONDERFUL take on pesto! I have tons of mint right now and I may well try this. YUM. I have to work on my O foods post, too. I’ve made all kinds of pesto but never thought to make a mint one! How delicious! Thank you for sharing this recipe and reminded us, female foodies about Ovarian Cancer! Ivy you are so caring and such a wonderful friend. Your pesto looks delicious, I can’t wait to see the other recipes! Oooh, I have some mint in my garden. Looking forward to seeing of some of your recipes to make some. Thanks bringing awareness for this problem, which is an affair of all women. Hopefully the younger generation will be much luckier. Ivy, the mint pesto sauce looks great! Very interesting flavours going on here .. i have made pesto with almonds, hazelnuts and walnuts … but never varied the cheese … love halloumi so I will try this out Ivy! Delicious pesto! And, so many great uses for it. Thank you Ivy for your neat descriptions and came to know more about macaroni. Very nice of you. I saw this in FB & had been wanting to come over.. sounds so refreshing with mint!! beautiful. Hello Ivy, delightful recipes and your previous post on Issioma moved me so much, as my mother is from Ano Karyes and I spent many happy summers there as a child… Thank you! Thanks for spreading the word regarding ovarian cancer! What a terrific pesto with mint & almonds, excellent! Cooking for a cause is great!! !I love cooking. I will try that one,PestO…yummy!!!! I love to eat…I think that one is so delicious…I could ask my wife to cook PestO. can't wait until it stops raining to make this pesto.